Brown Bike nearly fell over in excitement on today's drug run. Such outward displays of emotion can be risky in traffic or even without traffic so I discourage them. As I was wheeling BB at the time, negotiating a flower bed and narrow gateway, we were reasonably safe but I had to sharply remind him that I disapprove of his having a lie-down whenever he fancies it. A previous generation might have administered a short, sharp slap. But ever since John Cleese demonstrated the unapproved method of beating a broken-down car with the branch of a tree, we live in enlightened times and no longer use corporal punishment on our vehicles. Besides, BB had a reasonable excuse for excitement. I initially thought our way was blocked, but then my own heart swelled with pride. There, in front of us, in magnificent isolation, at the edge of the lawn in the garden of my doctor's surgery, was a Sheffield stand. 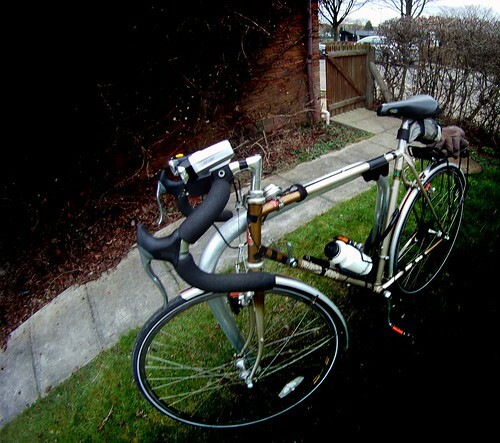 It was installed especially for Brown Bike and is for his exclusive use, although he has generously agreed that other bikes may use it when he doesn't need to. A more cynical view might be that we are within spitting distance of financial year end, and the surgery found some loose change at the back of a settee, but we prefer to believe this is an unexpected gift for BB. With my critical hat on, it isn't quite ideal. I'd prefer it to be further from the entrance gate, less visible from the road but in plainer view from the patients' waiting room. In my email to the surgery a year ago, I suggested some stands (plural), ideally covered for shelter from the weather, protected by a CCTV system, with a rearranged flower bed so wheeling bikes in and out would be easier. I never expected all that so I'm not complaining. Indeed, I had nearly given up hope of getting anything. 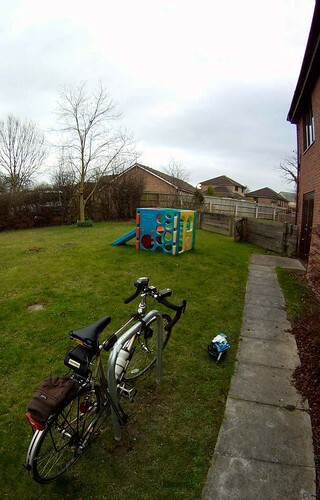 The children's plastic climbing frame has served us well, and Papworth isn't well-known for a strong cycling culture: I have seen exactly one other cyclist in the village, and that was only once, and was a child, and wasn't at the doctor's surgery. From a conversation with my GP, I understand that I am the only person to have ever asked for a cycle stand. If so, we really can claim this is BB's personal stand. Arguing against myself, perhaps I should be pleased that the stand is visible from the road. It's an advertisement for cycling, sending the message that the NHS encourages people to cycle to their GP. It normalises cycling. It is a small but important step. And it tells me that lobbying and campaigning is not a total waste of time. I hope that someday we will roll up and find both sides of the stand occupied by bikes, with no room for BB. But don't tell him I said that. Posted by Alan on March 9th, 2012. Having now successfully influenced the surgery to install the cycle stand, wouldn't it be fantastic for the surgery staff to cycle themselves! I found myself thinking about the staff in our own surgery. As far as I can remember only one of the Doctors is in reasonably good shape, the rest could certainly do with losing a few lbs themselves. Well done! As you say, can't complain, but the stand's position does seem a bit random just stuck in the grass. My local supermarkets (but not doctors or dentists or post offices) have those types of stands outside, but to be safe you have to remove lights, pump, saddle bag, bottle, bike computer, etc and carry them around in a bag. Sometimes I also remove the saddle or pass the lock cable through the saddle rails. The bank is best – you can take your bike inside. 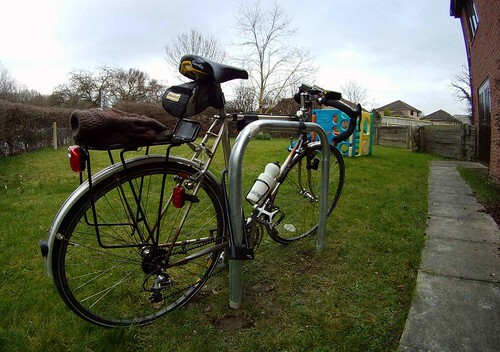 To encourage people to cycle, secure bike storage seems much more important than cycle lanes. Generally, "surgery" and "shock" are not two words you want to see in the same sentence. You have disproved the rule, Alan. Well done on prodding an incremental change. Those are ver-ry wide angle photos. Wide angle: yeah, I only had the GoPro with me. My own GP is fit. He used to be (perhaps still is) the expedition doctor on various mountain climbs in the Himalayas. Dunno about the other staff, but there is no evidence that any of them cycle. I reckon anywhere that provides car parking should also provide bike parking. New developments around here such as the shops in Papworth do, but older developments like the hospital don't. It's a bit daft of me to get worked up about a single stand that cost probably under £100 including labour, but small things like this can make a big difference. Its definitely a step in the right direction, quite a result I'd say! This is good news Alan, as Hilary says, a proper step in the right direction. BB by the way, looks like he properly glows with pride. I am so pleased your letter made a difference. I leave my old CTC mags at my diabetic clinic.